The Manipur Government on Friday suspended two police sub-inspectors in connection with incidents of arson along National Highway-37 on the Imphal-Jiribam Road. 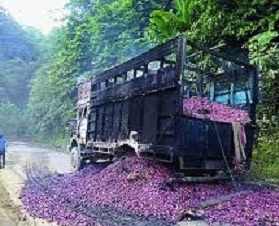 A report appearing in the The Indian Express stated two loaded trucks and a passenger vehicle were torched on Thursday by protesters supporting the bandh in the State. The report further stated that the 24-hour shutdown was jointly called by Zeliangrong civil bodies. Bandh supporters also inflicted damage on at least two passenger vehicles along the highway, but no human casualty was reported. A Government order said disciplinary action is being contemplated against the two sub-inspectors for “dereliction of duties”. The order also barred the two policemen from leaving their headquarters without permission. Zeliangrong — a constituent of three Naga tribes, including Zemei, Rongmei and Liangmei — gave the shutdown call demanding arrests of NSCN-IM functionaries for alleged threats to Zeliangrong’s leaders life. The bandh was called from midnight of August 15 to 16 last.